Still hotter than heck here….I think my car temperature gauge clocked 107 today, 112 in some places. A lot of people in the Pacific Northwest do not have air conditioning since it is always so pleasant here. Cooling centers have opened where folks can go to escape the oppressive heat. I am truly thankful we have air conditioning. It’s brutal out there. However, even though it’s cool inside I still didn’t feel like cooking a big meal. I purchased a roasted chicken and decided to make some Chicken Tostadas with a Smokey Cheese Salsa. I did turn on my stove to fry up some white corn tortillas but that was it. The key here is using a smokey cheese, it makes it interesting. So stay cool and make these for dinner. Serve with sangria and enjoy! 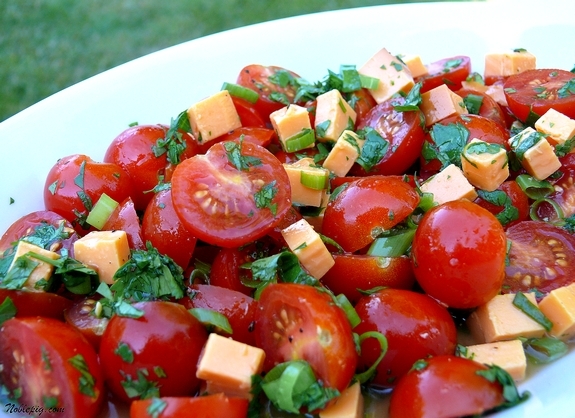 In a medium sized bowl toss together tomatoes, cilantro, lime juice, cheese, red wine vinegar, green onion, salt and pepper. Let sit for 15 minutes. While waiting, fry the corn tortillas to your choice of crispiness. Shred the roasted chicken and build each tostada to your liking. Dollop with sour cream for extra flavor. I could have eaten ten. I stuck with two for good measure. While waiting, fry the corn tortillas to your choice of crispiness. 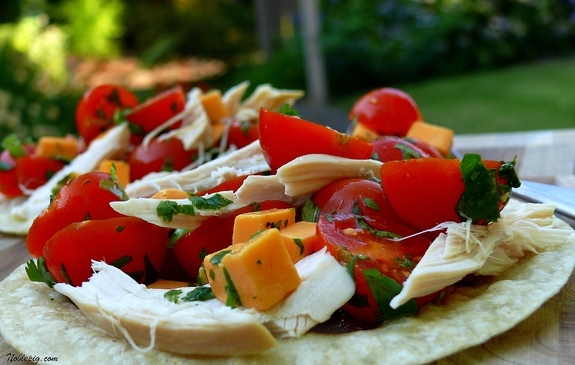 Shred the roasted chicken and build each tostada to your liking. Dollop with sour cream for extra flavor. We haven’t had much of a summer here. If you saw my boating photos – I was actually wearing a jacket! We are finally warmer this week but we are almost at summer’s end! ack! Great looking tostadas! I should make these and at least FEEL like summer! Goodness,it is after 3:00 a.m. and still 80 degrees in the house. And yet, you have made me hungry for this! I might have to fore go reading your blog til’ the next day noon..hopefully it will be cooler. Either way, I will probably be making this. I could easily dive head first into this. Love the smmoky cheese salsa.. I said MMM out loud, good thing no one except my puppy is awake yet. I don’t dare complain about the heat after the abysmal June we had in New England. But on a bright note, that salad looks great, and I just harvested my first heirlooms tomatoes yesterday. Yippee! That looks so good! I’ve been looking for lighter meals to fix! The only good thing about the 105 degree weather (we’ve been dealing for two months) is it makes you not want to eat…the bad thing is, it makes you not want to eat! I gave you a shout out on my blog–you inspired me! Wow, the tostadas look absolutely amazing!!! Those tomatoes are a feast to look at!!!! Great meal for a hot day!!! Cooking has become impossible in the hot/humid weather we’re having in the Northeast, so this recipe is perfect. Rotisserie chicken is the best invention since sliced bread; it’s saved countless meals for me. We are eating light meals right now and this tostadas would be perfect – I love the idea of a smokey cheese salsa! We are going to Reno on 08/10/09 to escape the heat in Texas and the Pacific NW is experiencing a heatwave? No!!!!!!!! Yum! It’s hard to be inspired to cook when it’s really hot but those tostadas look delicious! I feel for you up in Seattle! It’s been rainy and cool (low 90s) here in Texas. For us, that’s cool. We’ll be back to 100 degrees next week, they say. Hopefully that means the rain will come your way! This salsa looks delicious! This is very hot and sticky weather! My office space (with a/c in the next room) stays at a steady 85+ and going home later is not better. I will be glad for it to end. No cooking here, just leftovers or do without! But this looks great, and it shall be dinner for us – soon. Oooo tasty! It hasn’t been as hot back here, but our humidity is through the roof. These are the perfect warm weather food! I can’t imagine being in that heat! It’s about 80 here, and that’s plenty hot enough for me. This looks so good! Thank you for providing something quick and easy! I’m too hot to cut anything up though. I almost died going to the store to get more iced tea/pop/water. OMG–I have to have that! Like–today! I haven’t felt like turning my oven on either–this looks perfect!! Amazing looking food. I love tomatoes and that sure looks great. Ya’ll can sure have some of the rain that Mississippi is getting. It’s rained everyday for the past few days and it’s suppose to rain everyday next week. We need it to stop. Hubby is self employed. Rain = no work. Hope ya’ll get some relief soon. This is a perfect meal for hot weather. I can’t remember ever having a hot spell like this. Enough is enough. I love the tostadas with the roasted chicken and the smokey cheese salsa. My family would love these! I hope you get some relief from the heat soon. I could eat 10 of those too. This is so simple, light and healthy for this HOT summer! *sigh* Another recipe where I wish I loved tomatoes. I suppose this wouldn’t be as good with red bell peppers, would it? Well, I guess I’m just going to have to come up with my own version, alas, it won’t be as pretty, but I’ll be able to enjoy it. I hope. Hoping you get a break from the heat wave. My oldest son, who still lives in Seattle until the 10th of August, when he moves here to Maine, says it’s really been awful out there. He doesn’t have AC at his place so he’s spending a lot of time in the pool or boating on Lake Washington. I can’t believe it’s so hot there! Yikes! This looks so yummy though! What a lovely summer meal! It’s been hot on the East Coast too, but not as hot as you. Yikes! That looks so good. I love smokey cheese so this would hit the spot! your tomatoes are glorious. just glorious. lovely light dish, cathy, and i hope you find some chill soon. Perfect summer meal! They’d be great with regular cheese — but I’m awfully fond of the smokey addition. Fresh and fab. They look so tasty – the smokey cheese is a great idea. What could be easier than that?? And it looks delicious to boot! I am sending you cool weather. I just don’t know when it will arrive. The tomatoes do it for me. Stay cool. I know that 100 + degree temp thing – here in Texas thats a normal summer temp for us. Usually reaching 101-104 with a heat index to 110! It is so crazy hot right now! Your tostadas are so fresh and fabulous! I would have had a hard time stopping at two as well! As a matter of fact, I am having that salad this evening! Delicious. Hope it cools off soon for you! That salad looks delicious. What a gorgeous meal! I’m sure this tastes every bit as good as it looks. I had no idea it got that hot up there! That salsa makes my mouth water. This looks like a great meal during these unusually hot Oregon nights. It looks like you’re getting settled into your new home. always something good to eat at your place. I made pizzas. I’ll try your tomato dish sounds good. 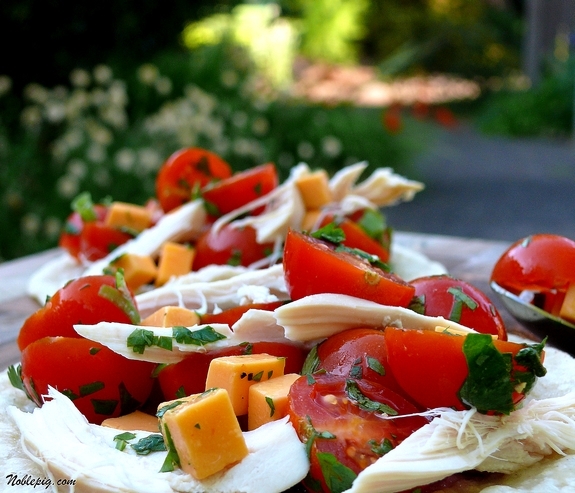 Savoury for me .. looks delicious .. great idea for the hot hot weather .. cool tomatoes, cool sour cream .. wonderful .. I can taste it now .. Beautifully done and anything with smoked cheese is win win. Plus cherry tomatoes are always ripe first and they never seem to die until frost. Try to stay cool! Having a refreshing dinner like that has to help. I did make this last night for dinner, quick easy and delicious. I had an avocado I needed to use, to diced it on top of the whole thing instead of sour cream. Very good and thanks for the recipe. Hi Cathy, I’ve been following your blog for several months and have really enjoyed it. The recipes and photos are fantastic, and I’ll be making this recipe very soon! If you have to live with that level of heat, I’m glad to see you’re feasting on beautiful light and incredibly colourful food. Gorgeous. How much green onion? It’s not listed in the ingredients yet you mention it, and it seems to be present in the pictures. Fixing it tonight. I just sprinkled a few on top. Use as much as you like. Thanks. I used 1/4 cup of green onion, smoked gouda, tossed the chicken with the salsa, and used two tortillas for each serving to make tostadwiches. Really, really good. Thanks for the recipe. I am SOOOOOO going to make these this weekend. I made this a couple of weeks ago for my family. I used grilled diced chicken breast, and I added leftover roasted sweet corn kernels to the salsa mixture. For the cheese I used Tillamook smoked cheddar. This was sensational. We loved it.